The design of this pump is the result of operational experience in the Devon and Cornwall China Clay (Kaolin) industry, spanning a period of well over half a century, resulting in the 25/25 CCDC Gravel Pump. Its concept promotes considerable cost savings, by encasing the wearing components within a strong steel casing. This casing is capable of withstanding the dynamic and transient pressures in a way that hard-iron bowl pumps cannot. With the benefits of operational and maintenance economy, safety is enhanced, and individual components are considerably lighter for handling and transport. 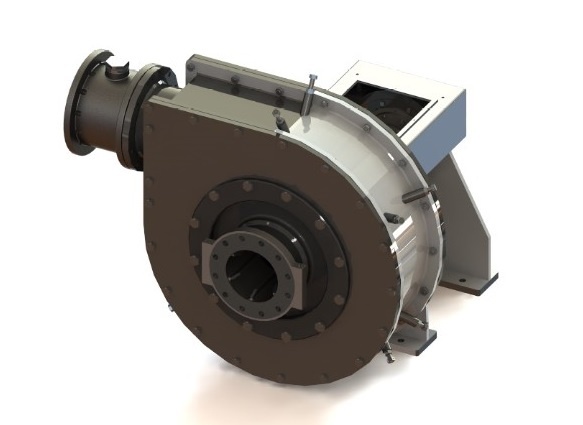 In aggressive gravel pumping conditions, where the quartz sands and gravels are highly abrasive, constant correction of the running clearance at the impeller eye is vital to maintaining pump efficiency. This pump has the unique feature of being adjustable by the simple injection of grease with a normal grease gun, taking just a few minutes in a week, without needing to shut down the pump or carry out any invasive operation necessary with other design types. The impeller is mounted on a shaft, with bearing and housings of extremely robust design, to withstand the rigours of pumping all kinds of aggregates up to a nominal 150mm sphere, which will pass through the impeller. The impeller is dynamically balanced to promote smooth running. All the major wearing parts are removed and replaced using purpose designed lifting equipment, load tested according to regulatory requirements.